The drop comes after Thursday’s market selloff spread to Europe and Asia. Stocks are continuing their slide Friday, with the Dow Jones industrial average opening down 230 points, or 0.95%, after President Donald Trump said that trade wars are good. 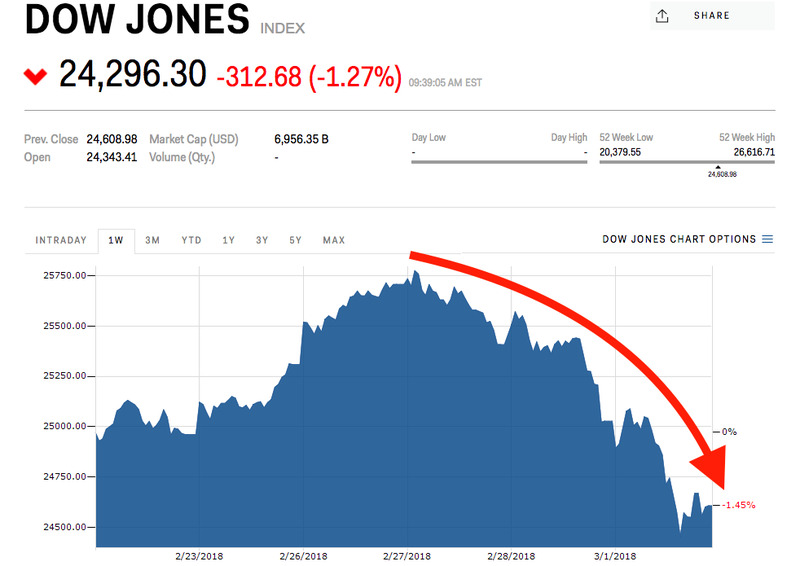 On Thursday, Trump confirmed new 25% taxes on imported steel and 10% on imported aluminium would be announced next week, sending the Dow down almost 600 points at its lowest levels. Japan’s Nikkei closed down 2.5% Friday, and Germany’s DAX was down 1.96% at the time of writing. The news also raised the spectre of a trade war, in which the US and other countries increase protectionist measures back and forth. Economists say such a fight would ultimately increase prices for US consumers and possibly lead to a broad economic slowdown.